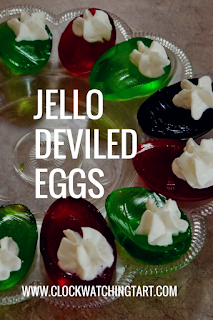 These jello deviled eggs are super cute but weren't that easy to execute. You can buy an egg mold to make life easier, but I used these plastic eggs from the dollar store that open at the equator and it wasn't easy to get the jello out. All you need is Jello in various colours, egg molds, cooking spray and boiling water. Mix the jello with 1.5 cups boiling water and stir for 3 minutes. Spray the inside of the plastic eggs with cooking spray. Fill the eggs with liquid jello. Ideally you will fill it completely and make a full, solid egg. But if it is only half filled it will make a half egg which works great as well. Refrigerate the filled eggs for at least 3 hours in a bowl or tray lying on their sides. 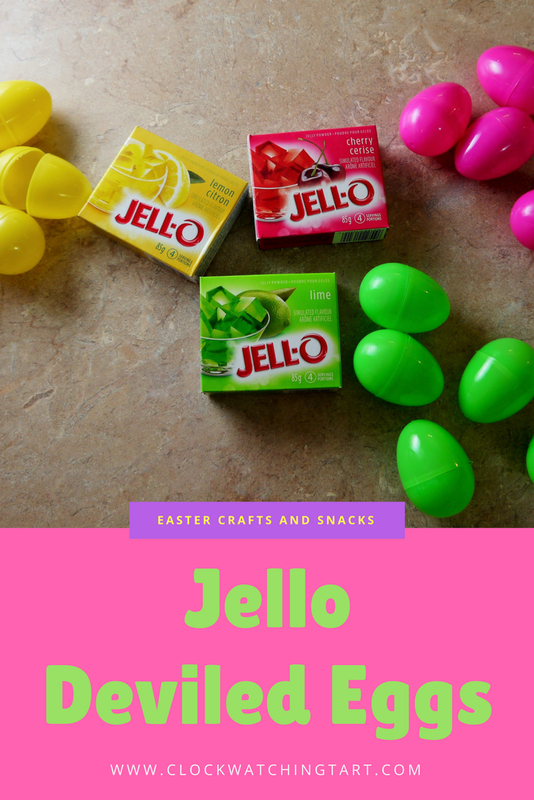 To remove the jello from these eggs, it was easiest to run the closed egg under running water and squeeze it all over to let air bubble between the set jello and the plastic egg. Some broke in half but most came out as a whole or half egg. Slice the whole eggs in half with a sharp knife. If you have a deviled egg tray, that's a great way to serve these. I used simple whipped cream to devil the eggs, but once the whipped cream is added, they need to be served and eaten right away or the whipped cream will melt. For a more stable filling that can sit out for an hour or so, whip together 250 grams cream cheese, 1/2 cup sugar, 1/2 cup whipping cream and 1 teaspoon vanilla until stiff peaks form, then use a star-tipped piping bag to fill the eggs. These are very cute and fun for kids! Happy Easter! We're having Prime Rib for Two and Little Hasselback Potatoes for Easter dinner. I hope you're spending time with family and having a great day! The Beer Baron - Light & Dark with Dieu du Ciel!